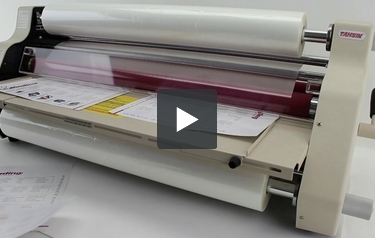 MyBinding's digital laminating film is the ultimate film for use with digital prints that are harder to laminate. It is specially formulated with an ultra-aggressive super-stick adhesive, making this lamination film an excellent choice for use with Oce, Canon, Xerox, and most other digital production output devices. It is compatible with most toners, fuser oils, and special coatings used today in the digital printing industry. Need Gloss Ultra Grip, Matte Ultra Grip or DryLam SAP laminating films? We have many thicknesses and sizes, suitable for any applications! Choose from our huge selection below, you won't be disappointed! This is MyBinding video. MyBinding.com’s digital laminating film is the ultimate film for use with digital prints. Specifically formulated with an ultra-aggressive super sticky adhesive, this lamination film is an excellent choice for almost every digital production output device. If you’re looking to protect your prints and photos with integrity and longevity, our digital laminating film is what you need. We have the guaranteed low price on both gloss and matte finish as well as 1.7 to 10 mil in thickness, and our rolls can come up to 3,000 feet in length so you get the best bang for your buck. Give us a call, we can help you out. When image matters, MyBinding.